A big problem with iCloud Drive’s Desktop and Documents Folders synchronization feature is that, by default, iCloud Drive automatically deletes local copies of files when you start running out of storage—by whatever definition of “running out of storage” macOS internally relies upon. The file still appears to be available, but it’s in iCloud, and if you want to access it, macOS downloads it when you try to open or otherwise manipulate it. However, there’s a way to avoid this, so long as you have enough storage. In the iCloud system preference pane, click the Options button next to iCloud Drive. At the bottom of the Documents tab’s dialog box, there’s a checkbox labeled Optimize Mac Storage. When this box is checked, which is the default option when enabling iCloud Drive, macOS deletes files as need be. This applies to all iCloud Drive files, including items you place in the folder, apps that use iCloud Drive (and have their box checked in the Documents tab’s list), and Desktop and Documents Folders. 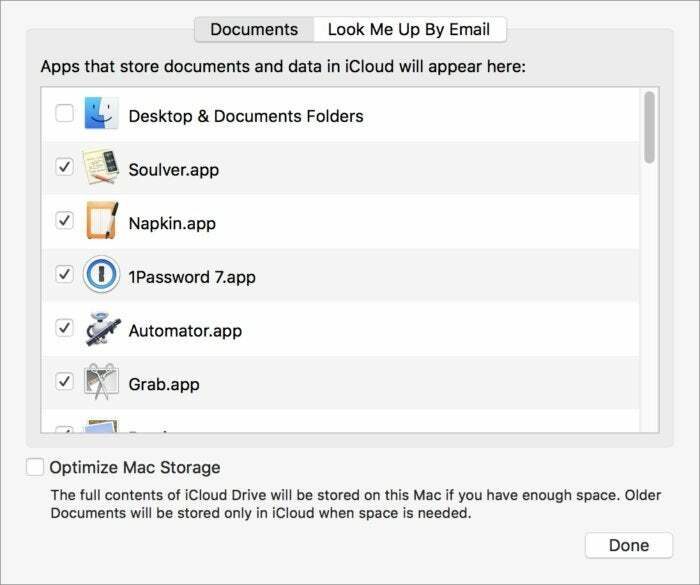 You can opt to uncheck Optimize Mac Storage and always keep all iCloud-synced files stored locally. But if you uncheck the box, all files remain stored locally. This does defeat one of the major points of the feature, which is managing storage automatically. Since I disagree with that feature from a backup standpoint, I think this is dandy. Your opinion may differ. The other main benefit of iCloud Drive sync is making these files available in iCloud Drive on other Macs, in iOS, and via iCloud.com. If you’re going to use the option for sync, I highly recommend disabling Optimize Mac Storage. If you have multiple Macs, you should disable it on all of them—but first be sure that you have sufficient storage on each Mac to handle the full Desktop and Documents folders combined of all your Macs.